Spending time together over family meals has never been more important. With the rise of modern technology, family meals are disappearing from households around the world. Dedicating time to spend with your family discussing activities, triumphs and concerns will allow your family to grow into a healthy unit. If you have a busy family and can't find other moments in the day to interact, dinner time is the perfect solution. Instead of sitting around the television, eat dinner around the table and spend some good old-fashioned time with your loved ones. When you are trying to get your family to sit down at the dinner table, you may be concerned about your little one and where you will place them so they can be a part of the bonding too. There is an extensive range of child booster seats designed especially for dinner table use. Each seat comes with its own set of features, but how can you know which one is perfect for you? In this article, I’ll be exploring eight of my favorite child booster seats, looking at the ins and outs of each. Not sure what you’re looking for when it comes to child booster seats? Not a problem. I have also included a step-by-step buying guide to ensure that you have all the information you need to make a well-informed purchase for your child. For more sociable mealtimes involving the whole family, here is my list of the top eight booster chairs that are perfect for your child. In my opinion, this is one of the best all-round table booster seats on the market, which is suitable for young children. This seat is completely adjustable with five stationary settings that can be set as your child grows. These adjustments require no tools, and you can change both the depth and the height of the seat, so your child can fit securely and comfortably into the seat. With regard to safety, this booster seat boasts an outstanding five-point security harness system, making sure that your child is always strapped in securely. The front tray has the capacity to hold over 7 ounces of spilled food or liquid, which minimizes the risk of food and drinks pouring all over your floor. What's Great About It: The best part of this seat is the overall flexibility. Alongside the 5-point adjustment system, the entire booster seat can be converted into a youth chair. This feature allows you to save money and give your child a seat they will use for years to come. This booster seat is ideal for smaller houses or families looking to save space. 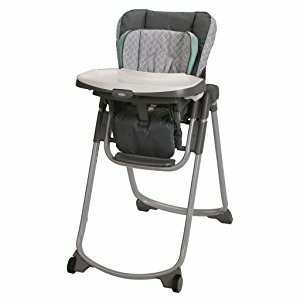 Many booster seats take up a lot of space, but the Slim Spaces Highchair boasts a compact design. You can easily fold it up and store it when not use. Each part of this booster seat is stain resistant, and the seat pad is machine washable, so you can keep your little one clean. This seat boasts six height settings and three recliner settings, giving your child absolute comfort when using the booster chair. These adjustable settings mean that you won't have to buy another seat as your child grows. The Slim Spaces comes with a high-quality body support setting, so your child can be comfortable while eating. 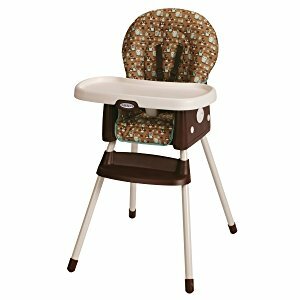 This booster seat has a three and five-point harness system, meaning your child will always be safe during mealtimes. What's Great About It: The entire set comes pre-assembled which allows you to take it out of the box and start using it straight away. The set is delivered using patented Frustration Free packaging, making it even easier for you to set it up. One of the most affordable booster seats on my list, the Musty Grow Up is a small, convenient booster seat solution. Designed using a professional and sleek European style, this seat is both elegant and functional, keeping your child safe and comfortable. Its smaller size means you can place this booster seat wherever you want. 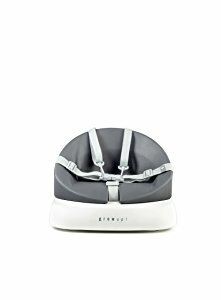 As this seat is smaller, you can easily keep it clean and hygienic, and the harness system keeps your child secure and safe at all times. The high-quality straps are easy to use and can be used to connect the seat to any four-legged chair. What's Great About It: Ideal for domestic use, this seat can be easily taken with you wherever you go due to its portability. You can safely and easily use this booster seat while out and about, while enjoying the safety and comfort benefits of this seat. One of the market-leading brands when it comes to child booster seats, this chair is made using the highest quality metals, polyester and plastics, making sure you get the maximum amount of durability. 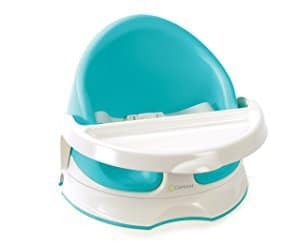 This booster seat is a 2-in-1 solution, which can stand on its own four legs when your child is younger and can be easily converted into a booster seat later on. The seat has three adjustable reclining positions, and the fabric section of the seat is removable and machine washable. The front tray can be removed with one hand, so you can secure and remove your child with the other, and there’s a convenient built-in storage area. What's Great About It: This booster seat is specially designed for parents who are looking for a chair that is easy to use. With the removable tray, easy-to-use safety harnesses and easy-to-clean seating, every action is quick and easy. The Contours Grow with Me brings something different to the market. One of the more affordable booster seats on my list, this 3-in-1 solution provides you with the perfect seat for your child as they grow. This seat is perfect for the dinner table, but can be used on the floor, on chairs and outside. The three-point safety strap system allows you to safely secure your child in the chair. The top half of the chair has a removable foam seat, making it easy to clean. The front tray boasts incredible depth, so all of your child’s food, drinks and toys won't fall off, and can be fully removed and cleaned. The seat has dedicated straps to secure it to any four-legged chair. What's Great About It: As the name suggests, this seat twists a full 180° on a swivel base so you can face your child in the direction you need during dinnertime. This seat is ideal for families looking for a high-quality seat with a low price tag. Produced using the highest quality stable plastic, this seat is perfect for domestic use, or for taking it with you on the go. The rear section of this booster seat is completely removable, so it is easy to clean. The three-point harness system means you can easily and quickly secure your child into the seat. The bottom of the seat has two installation straps, making it easy to secure to any four-legged chair. 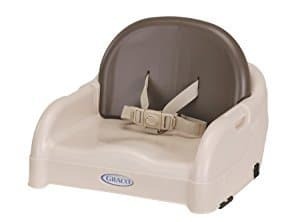 What's Great About It: This seat is very functional and is 100% compatible with all Graco Blossom products. If you are looking for a portable booster seat that you can take with you wherever you go, the Prince bebePOD may be just what you are looking for. Made from the highest quality plastics, this booster seat is lightweight because it is foam inside. The compact design provides absolute comfort and support for your child, and the lap harness keeps your child safe and secure. The two-point strap system also adds to the high level of safety. 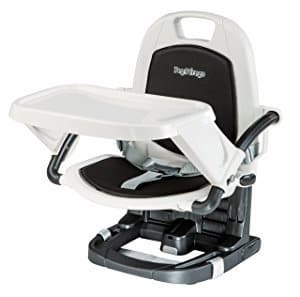 The front tray makes it easy to store all of your child's food, drinks and toys at dinner time, making this one of the most multi-functional booster seats on my list. Suitable for any budget, the seat has wide legs and a high back to provide maximum support. What's Great About It: This seat is very durable while still being lightweight, which means you can take this seat wherever you go. This mid-range booster seat is ideal for families who are looking for an all-round, flexible seat that doesn’t compromise on quality. 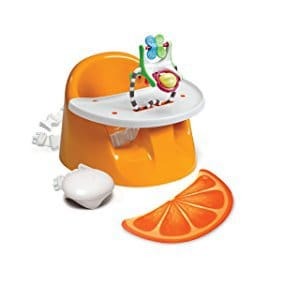 Made from 100% high-quality Polyurethane plastic, your child will be safe while eating and playing in complete comfort. The seat boasts five adjustable height settings with moving parts on both the back and base, allowing you to find the ideal position where your child is most comfortable. The seat prides itself on a three-point harness system, allowing you to safely secure your child. You can also secure the seat itself to any four-legged chair, both at the back and underneath. What's Great About It: The high-quality, removable front tray allows easy access for your child as well as cleaning. The seating material is easy to keep clean due to its durable and easy-wipe surface. The carry bag allows you to easily transport your booster seat to wherever you go. If you are not sure what to look for when considering the perfect booster seat for your child, here are some things to keep in mind that will enable you to make the best decision for your child. 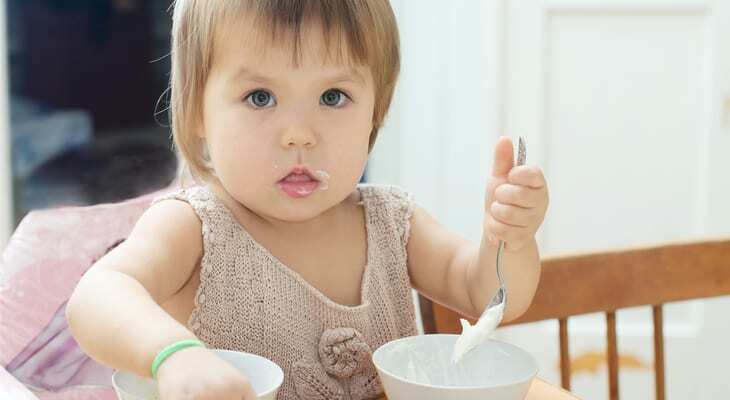 Children make a mess when they eat, especially at dinner time. By investing in an easy to clean booster seat, cleaning up after dinner will never be a problem. Look for seats that have a removable tray for easy cleaning. Also, getting a seat where the seat part is removable and machine washable will save you a lot of time. Safety is the most important aspect to consider when buying a booster seat. Any seat with a three or five strap system should be secure enough to hold your child in place, allowing you to leave them in place without having to worry about them climbing out while you’re laying the table or cooking dinner. Another vital safety feature, mounting straps allow you to securely fasten the booster seat to a chair, whether you’re at home or out in a restaurant. Always look for a seat with back or bottom straps that will safely hold the seat on a chair. Avoid booster seats if they have no mounting straps. Access is a very important when you have a fidgety little one. Your best bet is to go with a booster seat that has a wide back and wide leg holes. This means it will be easy to fit your child into the seat. If you can remove the front tray the process will be even simpler. Due to the material that the booster seats are made from, the weight limit is important. All of the seats on my list have a weight limit of around 40-50 pounds. Some seats may hold more while others will hold less. Always weigh your child before shopping for a booster seat. Whether you’re heading to your local restaurant or on vacation, having a booster seat that can go with you makes a difference. Choose a booster seat with a compact design that can fold up to be easily transported. Every booster seat on the market should have an age range clearly labelled on the seat or product description. This range is designed to fit and support children of that specified age range and should be strictly followed. If you don’t want to spend more money on a new booster seat every couple of years, invest in a chair that you can adjust until your child is old enough to use a bigger chair. Making sure your child has a valuable part in your family’s dinner time is so important for their mental and social skills. Finding the right booster seat for your child may take some time, but the benefits are worthwhile. 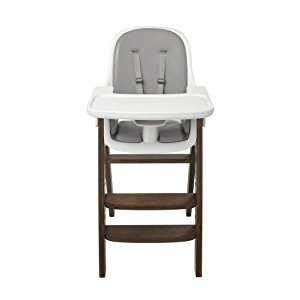 When you have found the ideal seat that keeps your child safe and comfortable, dinner time becomes a breeze. Now all you need to do is make sure they eat their vegetables.